Standardization and quality control surrounding solder and soldering practices for military electronics has been around for decades. Initially, the United States military used MIL-STD-454, MIL-S-45743, DOD-STD-2000, and MIL-STD-2000 to define soldering practices before merging with industry standards, such as IPC J-STD-001 and IPC J-STD-006. These standards attempt to ensure that the end results of a soldering operation produce a reliable connection that can be inspected and ensured to meet minimum standards of performance. This concept is essential for critical use cases like coaxial cable assemblies for Hi-Rel applications, and is part of creating MIL-DTL-17 assemblies . If improper solders or soldering practices are used, instead of forming a mechanically and electrically strong bond, a bond may form with a variety of contaminates, undesirable intermetallic compounds, and other defects. These defects can compromise the integrity of the solder joint, reduce the reliable lifetime, increase insertion loss, and lead to hard-to-diagnose failures. Many of the defects that are caused by improper solder and soldering practices may not be visible to the eye initially, and may require trained technicians familiar with the standards and soldering to deduce the problem. Hence, the requirements for Hi-Rel coaxial cable assemblies often require further inspection and testing that ensures mechanical and electrical performance. J-STD-001 is an industry standard guideline with details of practices and requirements for the manufacture of soldered connection for electrical and electronic assemblies. The practices and requirements laid out in J-STD-001 are divided into three classes based on the nature of their final use. Includes products suitable for applications where the major requirement is function of the completed assembly. Includes products where continued performance and extended life is required, and for which uninterrupted service is desired but not critical. Typically the end-use environment would not cause failures. Includes products where continued high performance or performance-on-demand is critical, equipment downtime cannot be tolerated, end-use environment may be uncommonly harsh, and the equipment must function when required, such as life support or other critical systems. 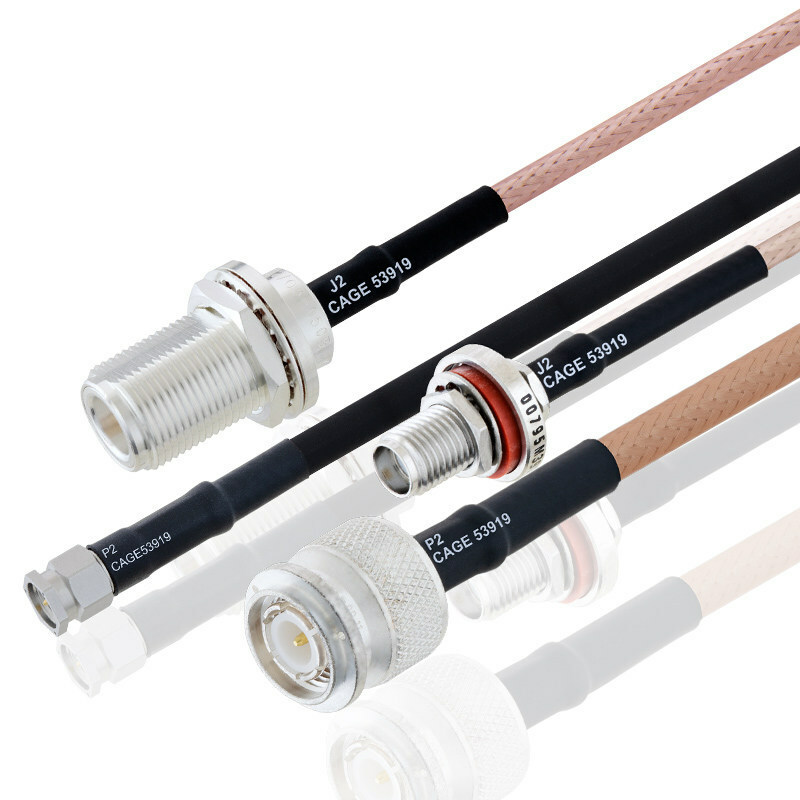 In the case of Hi-Rel coaxial cable assemblies, these coax assemblies are usually considered Class 3, which faces the most stringent requirements involving inspections and testing. Two other documents, IPC-HDBK-001 and PIC-A-610, are often considered companions to J-STD-001 and help to elaborate and clarify certain aspects of the standard. Within the standard, there are descriptions of soldering practices for a variety of electronics and assemblies, though only the general sections and sections on wire and cable apply to coaxial cable assemblies. The relevant sections describe preparation, suitable environments, process, and specific cases associated with wires and cables, such as allowable strand damage, insulation damage considerations, tinning wire, and etc. J-STD-006 defines the requirements for solder (alloys) for electronic applications. Though not related to performance, J-STD-006 is intended to help ensure solder alloy quality, and further describes the methods of inspection and testing to that end. Where J-STD-006 discusses solder alloys, J-STD-004 covers soldering fluxes, and J-STD-005 discusses soldering pastes. Using J-STD-006 solder alloys and following associated industry standard practices for handling and use (J-STD-001), can aid in producing a reliable product that also provides quality assurance to customers.